Cabra La Prudenciana - Zuercher & Co. Led by the Alvarez Valera family, Finca La Prudenciana is located in the core of the Castilla-La Mancha region in central Spain, approximately sixty miles south of Madrid. Although the family is famously known for their unpasteurized Artequeso Manchego, D.O. 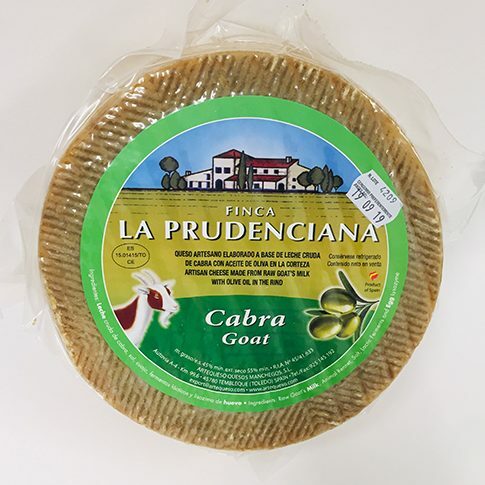 cheeses, Finca La Prudenciana extends their cheesemaking philosophies to Cabra La Prudenciana, their newest goats’ milk creation.Cabra La Prudenciana has a compact paste with tiny eye formation. Although slightly granular at first, it warms up nicely on the palate. Unexpectedly buttery for a goat’s milk cheese, Cabra La Prudenciana reminds one of its sheepy cousins. We are especially delighted that this cheese remains unpasteurized. The flavor begins with a fresh, tangy, salty bite, then lingers and mellows into a goaty, herbal finish.